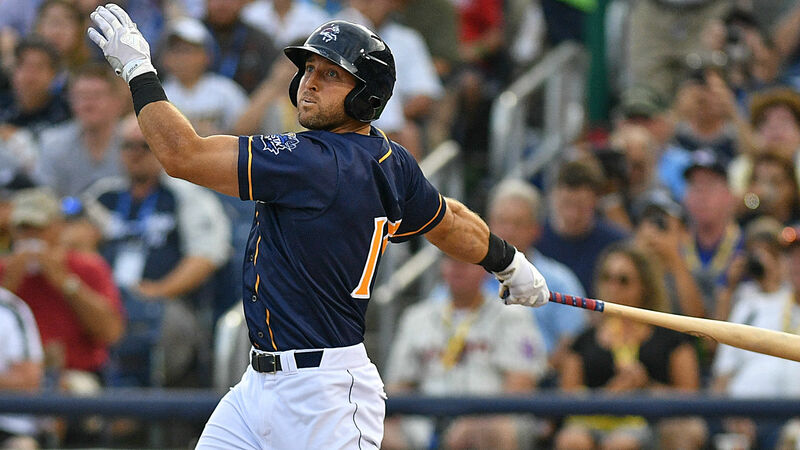 When it was announced that Tim Tebow was an Eastern League All-Star in Double-A, most people scoffed, others laughed and some people — including me — peeked into his numbers to see whether he really deserved it. But instead of discovering whether he deserved the honor, I found something else entirely. He could be only a couple of adjustments away from really putting it together. In fact, he’s only a couple of successful tweaks in his swing away from actually deserving his chance for a shot in the majors. That’s right. I said it. If he makes a couple of adjustments to what he’s trying to accomplish at the plate, he will actually deserve the chance to get that call to the majors. Scoff all you want, but let’s break down the numbers. Tebow is hitting .270 with the Binghamton Rumble Ponies with a .727 OPS through 267 plate appearances. That’s good for a 105 WRC+ in his second full season as a minor leaguer. This line was the reason he was an All-Star in Double-A. If you look deeper into his stats, you see his path to the majors. Tebow has a .120 ISO, a 35 percent K rate and an 8 percent walk rate — not very good, to say the least. The most glaring statistic is his .423 BABIP. While a .423 BABIP is obviously due to regress, it also tells me one thing: When the man puts the ball in play, he’s hitting missiles, but he’s not capitalizing on these missiles as much as he could be. Let’s jump even deeper. Tebow needs to know who he is. He’s going to be (or needs to be) a left-handed slugger who strikes out at lot, like Adam Dunn or Joey Gallo. In order to be a productive player in that mold, he needs to start doing a couple of things differently. This year, he’s hitting 55 percent ground balls. That’s much too high, especially as someone who will likely face a shift. He’s hitting home runs on 15 percent of his fly balls, which is pretty good. The problem here is that he’s only hitting fly balls 22 percent of the time. With the power Tebow has, that is nowhere near enough if he wants to be successful. The chart below showcases the groundball, flyball and home run per flyball rate trends of successful hitters who’ve fit Tebow’s potential MLB archetype. Because Tebow’s fly balls turn into home runs at a fairly decent rate, he needs to cut that 55 percent ground ball rate nearly in half. Logically, that means he’ll hit more fly balls and, most likely, he’ll hit more home runs as well as other extra-base hits. Home runs are good. A shift can’t stop a home run. So how can Tebow start hitting more home runs? It’s not as simple as just uppercutting the ball. A quick look at his spray chart reveals a couple of clues. Tebow hits the ball to the opposite side (44 percent) more than he does to the pull side (36 percent). If you pull up his spray chart and compare it to players more of his archetype, he’s hitting the ball to the opposite field more than twice as much than them. We don’t know for sure whether Tebow is trying to go opposite field or whether there is something in his swing that doesn’t allow him to hit the ball to the middle and pull side. It’s pretty unusual for a player with Tebow’s physicality and power to hit to the opposite field as much as he does. However, he could maximize his barrels a lot more if he can start hitting balls higher more often, preferably to the pull and middle side of the field, and not so many ground balls and balls to the opposite field. Tebow is an ox, and judging from his .423 BABIP, he has some legitimate juice and barrel skill. He’s listed at 6-3, 240 pounds, and we all know the kind of work he puts in the weight room. If he stopped going opposite field so often, he could increase his HR/FB rate. If he can start hitting more fly balls, it’ll lead to a higher ISO, slugging percentage, and, ultimately, OPS. No player can play in the big leagues and strike out 30 percent of the time and have an ISO in the low 100s. It’s possible Tebow strikes out more in attempt to swap his ground ball and fly ball rates, but in order for him to someday be a major leaguer (and a successful one) he’ll need to become more of a power hitter. And based off his BABIP skill, it’s possible and certainly worth the risk.